For a bit of a winter project (amongst others) and after spotting that the price of the HP dash has come down quite a lot since I last looked - I decided to purchase one and DIY retrofit it myself - so in case anyone else is tempted here's the guide. For ref I fitted this to a 2013 30th Anniversary model, aside from the differences in the ABS etc - the guide will be much the same steps to retrofit, the coding / programming will look differently but ISTA/P should work it out for itself for just about any year of K1300 (I think probably also a K12 but can't confirm). If you purchase from the above site (It's Rybrook Ltd really) you may receive a 10% discount for spends over £1000 (this is unfortunately...) if you don't get a discount code offered - try asking for one! Don't bother with a K+DCAN cable off Amazon either, I bought two - they both turned out to be cheap cr4p and never once talked to the bike. You may get them to work, but the prevailing opinion is don't even think of trying to program (ie flash) the modules in the bike with one of these - here be dragons!!! 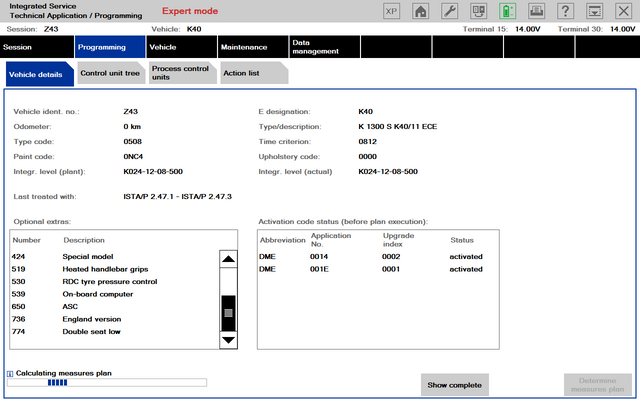 BMW ISTA/P (Our K13's are an older proto compared to the new GS's R1250s etc) so you'll want this as opposed to ISTA/+ (aka D as was) - try and get version 3.66. 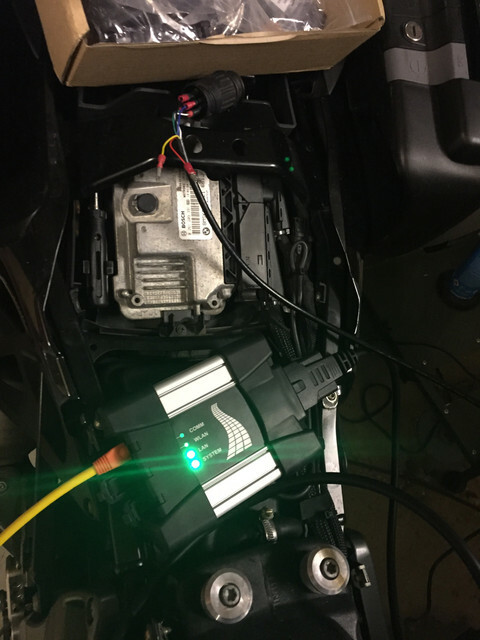 BMW ISTA/+ (D) - will do diagnosis for faults etc on our bikes, it will diagnosoe and flash F,G,I series cars and newer bikes - but for our purposes not really needed (handy for faults tho like I said). Try and get version 4.15.23. Top tip: Remove the screen and the trim panel behind the speedo (it pulls out) so you can get at the connectors - but do NOT remove the old speedo (aka KOMBI) until the ISTA/P software tells you to - it needs to read the milage off the old speedo before it can code and program the new. These are / were supplied to race teams for Moto3, Moto2 amongst others, what no one tells you really is that the BMW unit is bespoke (tho very very similar). I've worked out how you can use the 2D software to fully customise the dash over and above what BMW supplied. The socket for the cable is on the back of the dash at the top with a round plastic dust cover. I have as yet to actually try to program the dash as the software you use for this ...... is a little "involved" and it's literally only yesterday that I fitted and coded this all in! Armed with an install of ISTA/P (plenty of info out on the net so I'll not duplicate that here) ensure that you have a battery charger connected. I found an Optimate via the socket wasn't quite up to the job due to the cycles and programmes it runs - so a normal charger connected direct to the battery works better for this. Note how my odometer reading was "0km" this is when I had fitted the HP dash before starting the process, which is incorrect, start the process and only install the HP dash when ISTA/P tells you to. The two activation codes bottom right are for the Gearshift assist and the ASC I believe. There is a way to retrofit these without having to visit the dealer but I'll not go into detail here. The "integration level (plant)" is the firmware version the bike left factory with, and the "(actual)" field is what the bike currently has. This will change to a new version by the time we've finished - the "12" is actually the year part of the version number - we'll end up with an "18" figure version. There's also a method to retrofit the alarm if your bike doesn't have one (Like mine doesn't...........). 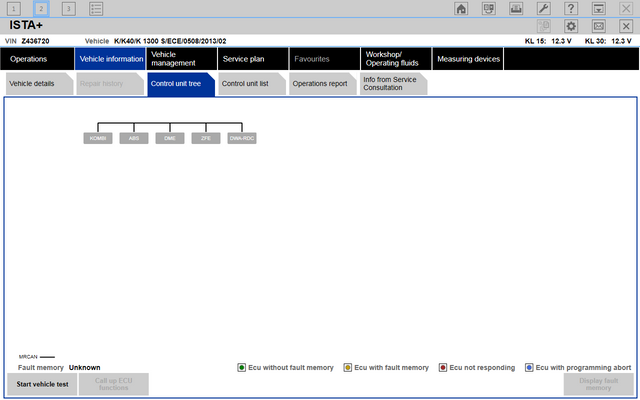 I'm missing an image for the next bit, but click on "Vehicle" tab (first screenshot) then "Conversion" and select "2D HP Dash" followed by "Determine Measures Plan". This is where ISTA/P works out what it needs to do. Only read half of the post, don't intend to do this, but just the info in the ICOM D cables and the ICOM or NEXT device is very useful. Thanks for posting! Thanks for posting Nick, very helpful for anyone wanting to do the same. Phenomenal detail - good stuff! One question though - what does an HP dash give me above and beyond the basic one? I've only ever seen pictures of them. I suppose you could argue it gets you a programmable shift light (you can adjust it for every gear if you so desire). There's stuff useful for trackdays (race mode etc, manual lap counter - though you can pay and add the IR receivers and transmitters if you wish). 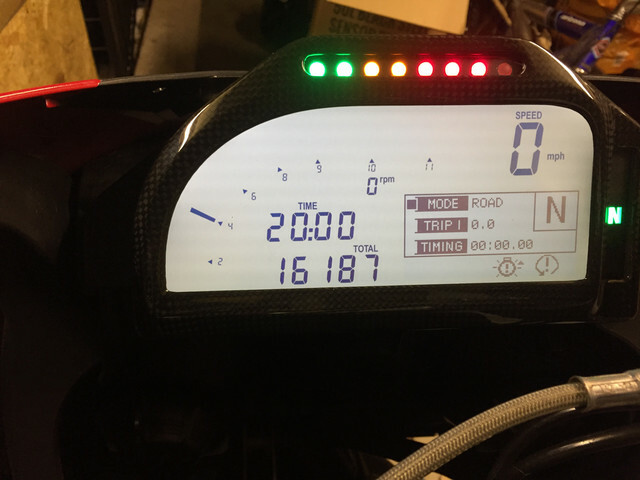 My plan is - given it's fully customisable, is to have it so the info button on the bike can scroll through additional metrics such as alternator voltage, oil pressure oil temp, coolant temp etc don't need it, but a fun nerdy little project all the same. 2D makes the following software which if you have / make the cable I mention earlier will allow you to program the dash to do anything you can think of (it's a CANBus peice of hardware this dash) - WinIt / WinARace. Thanks for the video. I could see myself buying one instead of the standard unit, if that broke. I like the warmup rev limit and the rev LEDs - easier to see peripherally than the normal rev needle. I guess it's the sort of dash you get on the fancier new bikes nowadays. That must be some dash at £1500 plus a throw. But then as an old boy I used to know would say. Yeh dinny look at the gearbox when yer welding the chassis, son. Must be doing something wrong. Can't ever recall taking a bike into the red. Superb write up with, what looks like, exactly the level of detail required. Well done. However, I'm with Tom. Approx. £1500 for a dash seems OTT to me. If I bought a bike with one on, I'd be very happy, and if one was available at £250 I may even be interested (if I still had a K1300S!!!!) but £1500? Not for me. Aye it's not really worth it in general, but I thought it looked cool and was a fun little project working it all out. I'm taking the view that as I absolutely love this K13, there's nothing else currently I'd rather have instead so I'm going to keep this one for eons and make it the best K13 to me it can be. Don't want that carbon can but I haven't found out yet if you can get the system without it so I can keep my existing titanium one. They're claiming 9 horse and a whole 3 lb/ft at the rear wheel, so with a power commander (I'd prefer not to fit one but don't see much work at all being done on the stock ECU really) it could make for a small - probably not noticeable improvment in the already pretty damned good performance. I know what this bike is allegedly supposed to be but it's an absolute all rounder for me (fitted a hepco and becker rack and top box to the BMW rear rack - I know, a top box ) so I don't have a problem with the contradiction that is chucking performance parts and touring parts at it at the same time! You been on the Pernod again Richard?